Provide comfort for the family of Jean Shane with a meaningful gesture of sympathy. Beloved wife of 65 years to Gerald Shane (predeceased). Loving mother of Betty Ann (Jim Horbul), Marlene (Arnold Weslake), Doug (Kim), Sandra (Sandy Stevens), Don (Donna), and Karen (Ed Bortolus). Cherished grandmother of Shane, James, Alison, Shannon, Elizabeth, Joseph, Dylan, Matt, Kyle, Scott, Shayla, Jennifer, Nathan, Samuel, Isaac, Mira and 9 great grandchildren (Baby Blake predeceased). Dear daughter of Herman Doyle and Agnes (nee Kelly) both predeceased. Loving sister of Helen (Linus Hearty), Mary (Thomas Kelly) all predeceased and Emmett (Merit). Sadly missed by many nieces and nephews. Our mother was a kind and gentle soul whose caring, compassion and generosity was reflected in all aspects of her life: a loving wife, wonderful mother, and doting grandmother. She felt her mission in life was to serve. Her heart was with her family and her home was open to all whether it was for a meal, a bed or advice over a cup of coffee. She devoted 40 years to Sudbury General Hospital as a neonatal nurse. In retirement, she volunteered with palliative care and committed weekly to the Adoration Chapel at our Lady of Hope Parish. Even when you thought she had no more to give, her innate sense of nurturing shone through at Pioneer Manor in all interactions with residents and staff. She had a kind word for everyone and was loved by all who crossed her path. With her twinkling blue eyes and contagious smile, she made everyone feel special and beautiful. Despite her petite stature, she was a force to be reckoned with! Her greatest legacy is her Faith in God, Faith in family and Faith in self. We know heaven will be much brighter and, quite possibly, repainted!! The family would like to thank the staff of Pioneer Manor (Second Floor, Poplar Unit), for their excellent care and compassion. In lieu of flowers, donations to the Pioneer Manor Residents Council or Hospice Shared Care Team would be appreciated. Resting at the Jackson and Barnard Funeral Home. 233 Larch Street Sudbury. Friends may call 2pm-5pm and 7pm-9pm with parish prayers 3pm on Sunday. To send flowers in memory of Jean Shane (Doyle), please visit our Heartfelt Sympathies Store. 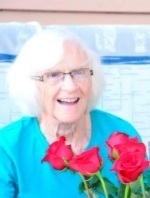 Consider providing a gift of comfort for the family of Jean Shane by sending flowers.